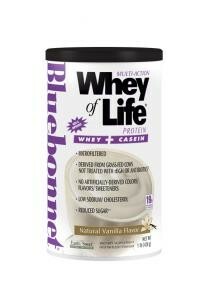 Bluebonnet Nutrition is proud to reintroduce to its line of protein powders new & improved Multi-Action Whey of Life® for those who want to lead an active lifestyle. This unique protein formula provides more protein (19 g) and fiber (2 g) per serving plus complimentary recovery nutrients that help rebuild broken down muscle, reduce oxidative stress, and provide immune support for faster/optimal muscle repair. And it does this now with less sugar and sodium making its deliciously natural vanilla & chocolate flavors in 1 and 2 lb canisters plus single-serving packets that much better for your customers. Bluebonnet’s Multi-Action Whey of Life® contains whey protein isolate/concentrate, micellar casein and calcium caseinate sourced from grass-fed cows that are not treated with antibiotics or recombinant bovine growth hormone (rBGH), also known as bovine somatotropin (BST). This dynamic multi-action protein formula was designed to handle the rigors of an active lifestyle by providing a perfect protein matrix of whey and casein and other supportive nutrients that work around the clock to maintain muscle mass, as well as general health and wellbeing. Whey protein isolate/concentrate have the highest biological values (BV) of any other protein on the market, which refers to a protein that has all the necessary essential amino acids for protein biosynthesis and also provides naturally occurring immunoglobulins that help support the immune system. Most importantly, whey protein is fast-acting for immediate amino acid replenishment necessary for those on-the-go who can’t seem to hold on to their muscle mass. Combined with long-acting micellar casein and calcium caseinate, this revolutionary wellness protein formula provides a rich source of branched chain amino acids (BCAAs) and glutamic acid and works continuously to rebuild broken down muscle for faster/optimal muscle repair. Bluebonnet’s Multi-Action Whey of Life® also includes complimentary recovery nutrients – including nucleotides, fruit polyphenols, vegetarian SOD/Gliadin (GliSODin®), immunoglobulins and L-glutamine – that help to reduce oxidative stress, increase energy, maintain lean muscle and support immune function, all of which are essential for those who lead active lifestyles, seniors and individuals in recovery. Plus, Bluebonnet’s Multi-Action Whey of Life® is so tasty and naturally good, even the sweetener, EarthSweet®, is loaded with powerful phytonutrients from juice concentrates making it the perfect, delicious snack without the guilt. So remember, in today’s world, life is a workout – at home, the office and the gym. But all this multi-tasking takes a toll on the body and its health. Fortunately, whether your customer is running five miles or running after the kids, Bluebonnet’s Multi-Action Whey of Life® helps him or her go the distance. Active individuals put their bodies through constant wear and tear breaking down lean muscle, causing fatigue and creating harmful oxygen free radicals. That is why the nutritional scientists at Bluebonnet stepped it up a notch by developing a multi-action wellness protein formula that keeps pace with the nutritional needs of a multi-faceted lifestyle and is also well suited for seniors and those in recovery since they often suffer from muscle atrophy, low energy and/or oxidative stress.